Please call the NCSS office at 919-556-9848. 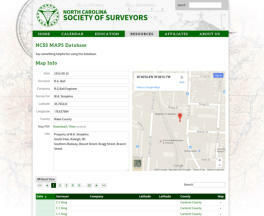 The NCSS Museum of Archives and Preservation of Surveying, Inc. (NCSS MAPS, Inc.) provides an avenue to preserve the past of surveying and invest in the future. The MAPS Database was introduced in 2011 as a way to record and preserve the maps of retired and deceased North Carolina surveyors. These maps, part of an ever-growing compilation, are housed here as a resource for members of NCSS. Page built in 0.00087 seconds.